This story has been updated several times since it was originally posted. See updates at the bottom. The BP oil spill is still dominating headlines, 50 days after the Deepwater Horizon rig exploded. But how much oil leaks into the Gulf on any other day of the year? 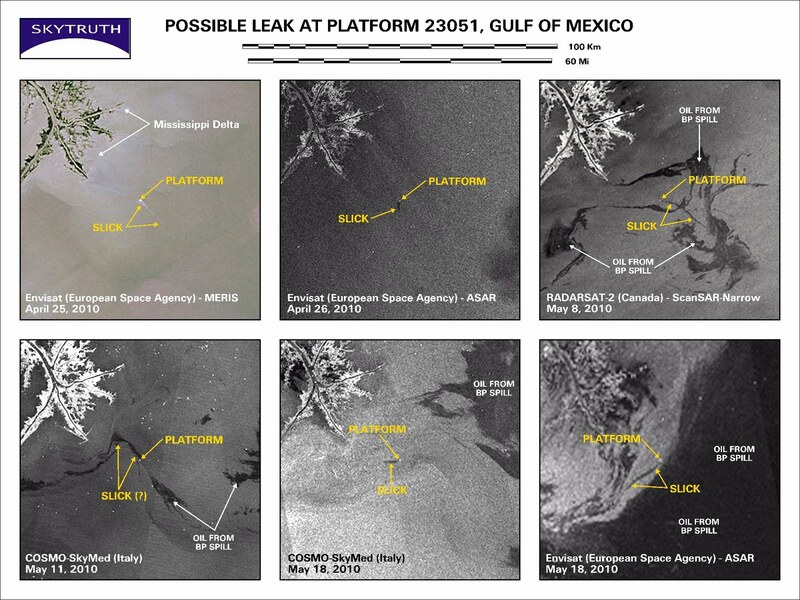 Satellite images and photographs from the region indicate that there may be two other offshore drilling units leaking oil into the ocean. John Amos, head of the West Virginia-based nonprofit SkyTruth, was looking at satellite images of the oil from the Deepwater Horizon site when he noticed what appeared to be another small slick of oil about 11 miles off the coast of Louisiana and about 40 miles from the major spill. Amos’ group uses the images to assess environmental problems; he was among the first independent experts to point out that the spill estimates from BP and the government were far too low, which has now been confirmed. Amos reported a “small but persistent leak or oily discharge” at a second site in the Gulf, one that appeared to be coming from platform 23051 in the Gulf of Mexico. It can be seen on multiple satellite images of the region. Minerals Management Service (MMS) records indicate that the platform belongs to Taylor Energy Company. Amos contacted J. Henry Fair, a New York-based photographer who specializes in artistic renderings of the human impact on the environment. Fair was in the Gulf last weekend taking aerial photos of the spill with the group Southwings, and at Amos’ suggestion sought out platform 23051. Fair found a rig with an oily sheen extending out into the water and snapped a series of photos. But upon closer inspection, it was a different rig—the Ocean Saratoga rig owned by Diamond Offshore. In some of Fair’s photos, a platform is visible in the background, possibly the one he was originally searching for, 23051. Amos couldn’t give an estimate on how much oil might be coming out of either site, though he noted that it is a “very small” amount. That would mean there are potentially two other operations in the Gulf leaking oil. So just how common are such leaks? The sad reality is, we really don’t know. source near platform Ocean Saratoga.” The Press-Register was able to confirm with the National Response Center that a spill had been reported, though the center did not give a date when it began. 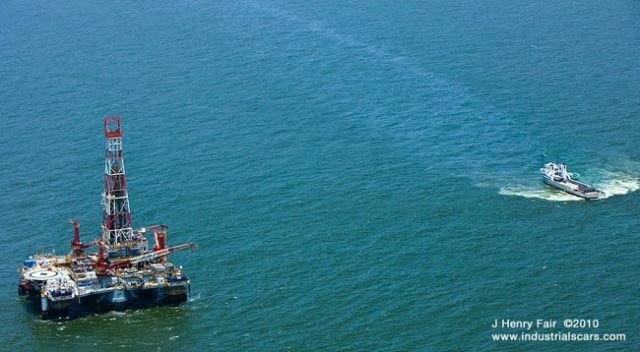 UPDATE 2: Taylor Energy, owner of the Ocean Saratoga, put out a statement Tuesday afternoon confirming that the rig has been performing an “ongoing well intervention program” to repair damage to the well that occurred in 2004 when Hurricane Ike destroyed a production platform there. The company states that the “associated surface sheen was minimal and never made landfall,” and that the “initial average observed sheen volume of nine gallons per day has been substantially reduced.” The company didn’t say what it has been reduced to at this point, or if the well has been leaking non-stop since ’04. I’ve sent in follow-up questions and will update as more information is available.